Taking off immediately from the cliffhanger that ended season five, Brooklyn Nine-Nine’s season six premiere begins with Holt revealing whether or not he was chosen to become commissioner. After a failed attempt to have everyone guess, he announces that he was chosen and the gang celebrates, with Jake running off to grab a boombox and jock jams. However, upon a closer reading of the email, Holt realizes that he misread and the email was in fact telling him that he was NOT chosen for the position. Jake, missing the reveal, comes running in blasting music and dancing on Holt. The next day at the precinct, Gina announces that Holt has taken some personal days and that Terry will be left in charge during the captain’s absence. Jake and Amy announce that they are using the money from their wedding insurance to have a super-deluxe honeymoon at a resort in Mexico that was recommended by Gina. (And they also announce that they intend to follow the “ABC Rule – Always Be Coconutting.”) Upon arriving at the resort, coconut drinks and the creepy gift of a “lovers’ tool box” from Boyle in hand, they discover that Holt is also there. Back in the Nine-Nine, Boyle confronts Gina, because he has learned that Gina’s mom has decided to divorce his dad. He asks for Gina’s help in getting them back together, but she refuses and without explaining why. Rosa goes to Terry for help, because the sanitation department is trying to take a case away from her, claiming it is in their jurisdiction (drugs were found in a sewer tunnel). Without an easy solution, Terry loses some of his decision-making confidence, and Rosa suggests that he consult the manual Holt created in case he became commissioner. 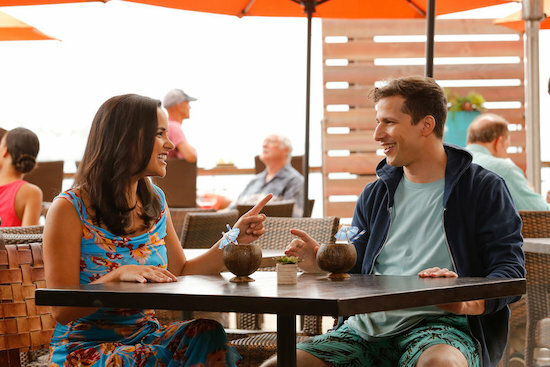 In Mexico at the resort, Holt reveals to Amy and Jake that he is despondent, not just because he didn’t get the promotion, but also because the new commissioner, John Kelly, is already enacting harsh, recidivist policies like bringing back “stop and frisk.” He decided he needed an escape and chose this resort because Gina was always talking it up. He did not even stop to pack clothes and instead bought all of his clothing at the hotel gift shop, including many novelty t-shirts and tank tops. He promises them that he will not interfere with their honeymoon and that they will not even know he’s there. This proves not to be the case, as he follows them around, bumping into them at restaurants, the pool, and finally, climbing into their hotel room while they are having a hot stone massage. Amy has the idea to invite Holt to join all of their planned couple’s activities, hoping it will help cheer him up and enable him to go back to work so that they can enjoy the rest of their honeymoon in peace. He joins them for activities like “sensual food tasting,” face masks, and a giant bubble bath. In the end he thanks them for including him and tells them that he feels better and that the activities helped him realize there is “more to life than just the NYPD” and that he is going back to New York. Back in New York, Boyle is still trying to get answers out of Gina, and Terry is hunting for the password to Holt’s computer, because he thinks that is where the manual is stored. After guessing the wrong password though, he breaks the computer in a panic (by smashing it) to stop it from wiping the hard drive. 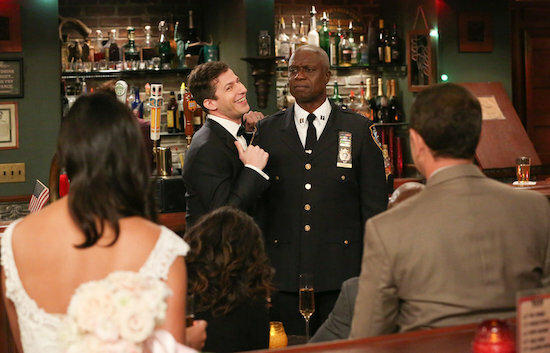 In Mexico, Jake runs into Holt as he is leaving and Holt reveals that he intends to quit the NYPD as soon as he returns to New York, because the activities he did with them made him realize there was more to life than his job. Panicking, Jake tricks Holt into returning to his hotel room with him, where they find Amy dressed as Bonnie Bedelia from Die Hard ready to role play. They tie Holt to the bed using the restraints they find in Boyle’s horrifying “lovers’ tool box” to keep him from leaving and then quitting. At the precinct, Terry fails at rebuilding Holt’s laptop and then attempts to sign into the captain’s cloud from his phone, but struggles with Holt’s security question (“What is God?”). 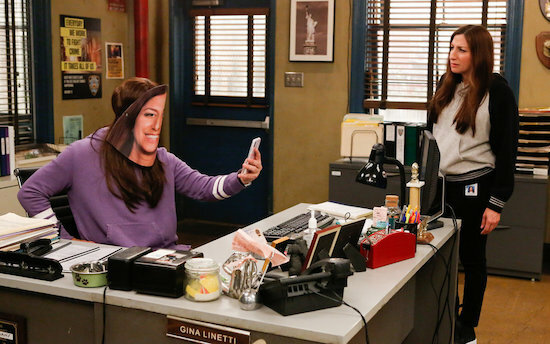 Boyle attempts to use Scully to get the information out of Gina, and after that fails, he puts on a mask of Gina’s face to try and unlock her phone. She catches him, but he is able to use her own face to unlock it and reads her text messages, discovering that she was the one that told her mom to divorce his dad and to not tell him why. In the hotel room, Jake and Amy try to reason with Holt to get him not to quit, but with no success. After Holt accuses Jake of being selfish, Amy loses her temper and rips into Holt about his wallowing and self-pity, saying she “no longer gives a hoot what he thinks” and storms off. Shortly thereafter, Holt manages to escape his restraints using the lube Boyle sent them and confesses to Jake and Amy that part of his despair and frustration at losing the position to Kelly was because he spent his entire career playing by the NYPD’s rules so that he could eventually get to a position of power where he could enact real change. Losing commissioner made him feel hopeless and like he was out of options. Until Amy yelled at him, making him realize that he still had a strategy left that he could employ. He could “stop giving a hoot” and stop playing by the rules. He decides that he is going to return to the NYPD but will go over the commissioner’s head and complain to the mayor about the new policy and threaten to create a stink in the press, knowing it will anger the NYPD. He also offers to pay to extend their hotel for a week so that they can have a real honeymoon. Back in Brooklyn, Gina confesses to Boyle that the reason she told her mom to divorce his dad is because she found out that her mom was cheating on him, and that she told her not to tell his dad because she was trying to protect him and keep him from getting hurt. Rosa comes to Terry with Holt’s manual (turns out it was a hard copy all along and was in Gina’s possession) and tells him to read a specific passage. In it, Holt writes that if the reader is ever unsure of what to do, they should go to Terry for help because Holt trusts Terry completely. This gives Terry his confidence back and he is able to give Rosa a solution to her problem.